Our does have been busy filling the milk pail as usual. Ginger, alone, milked over 1200 pounds in her 4th lactation! Unexpected complications from surgery in May 2017 necessitated downsizing significantly. However, we retained the best of our genetics in 4 promising young does who are already living up to the LegenDAIRY precedent set by previous generations in our herd. Likewise, the boys in the buck pen have excellent genetics behind them and we are very excited about our 2018/2019 breeding pairs. Historically, our kids have sold like HOTCAKES; and this year was no different. Buyers asked to be added to the 2019 waiting list before 2018 kids even left the farm! ​Our 2019 reservation lists are filling quickly. Follow us on Facebook so you don't miss out! We will once again be offering a $50 discount to 4H members and anyone buying 2 or more goats. ​ How can we help YOUR herd? Email DDL@NDGOATS.com. If the goal is milk in the pail, it's easy to freshen a doe. Any buck will do. 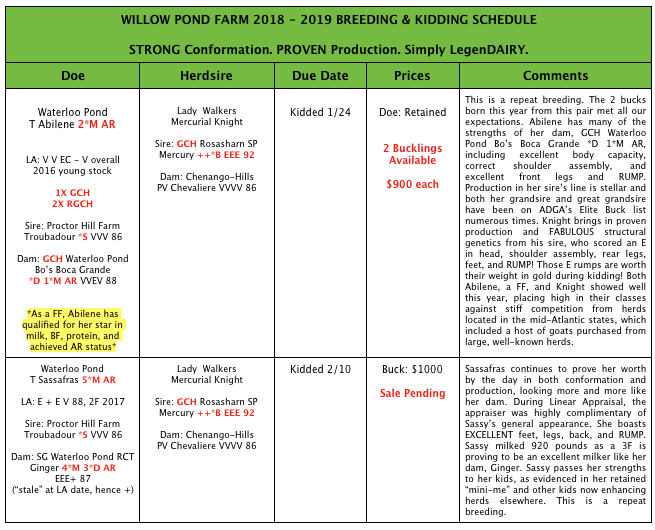 If the goal is strong conformation to the breed standard AND abundant production, much consideration must be given to the bloodlines in a herd; and the selection and acquisition of superior genetics is only the beginning. Raising a champion herd requires dedication and careful attention to nutrition, management, overall health, and the selection of breeding pairs. 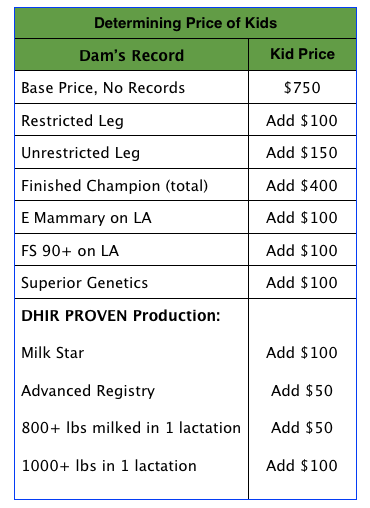 Validating the worth of a herd comes through the process of showing animals in sanctioned events, participating in Linear Appraisal, and participating in DHIR (Dairy Herd Improvement Registry). We are very pleased that in 2014, our first year on 305-day milk test, 5 does in or from our herd achieved Advanced Registry based on their production records and a 6th earned her star as a first freshener. Measurable results from performance programs give clear indication of the value of our breeding stock and their offspring. Using those results helps us to determine the price we set on a kid. Because we want to see our animals placed in homes and herds where they will be used and enjoyed, we also keep the economy in mind when determining our prices; and we NEVER price an animal beyond what we ourselves would be willing to pay for it. 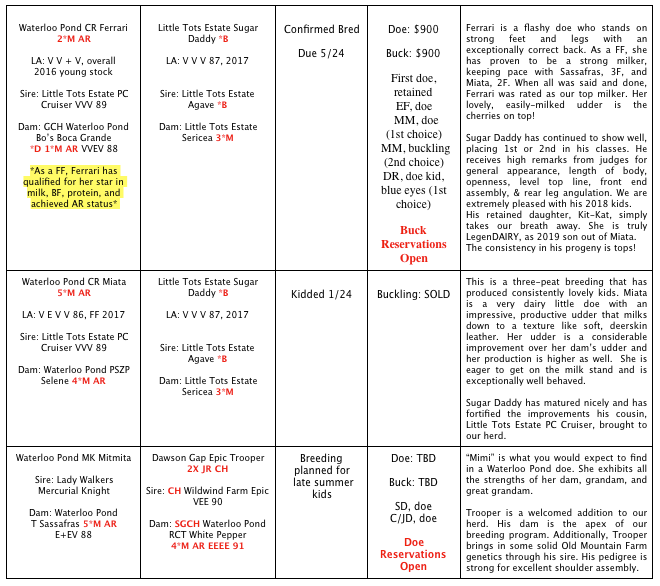 Likewise, we do not sell animals we would not use in our own breeding program; and because we can't foresee how kids will develop, sometimes it turns out that we've sold the best of the bunch. We are always glad, though, to see stock from our herd benefit others. 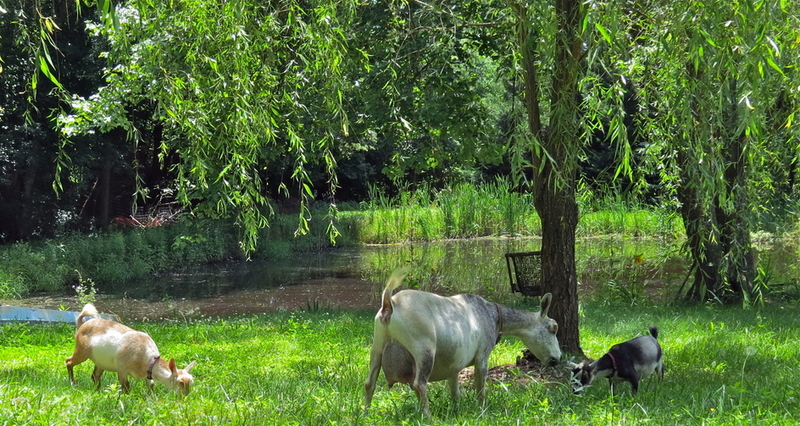 We are fond of saying "The earth is the Lord's and the goaties thereof!" ​HOW DO WE DETERMINE THE PRICE OF OUR KIDS?